Summer babies are so much fun…. There’s simply too many adorable summer-y clothes to spoil these fresh warm weather lovers with. From watermelons, to bugs, to strawberries….dressing baby up in anything summer related is a blast. When I first started designing, I also did Newborn photography. So I was constantly exploding with cute ideas for making those very first photos special. 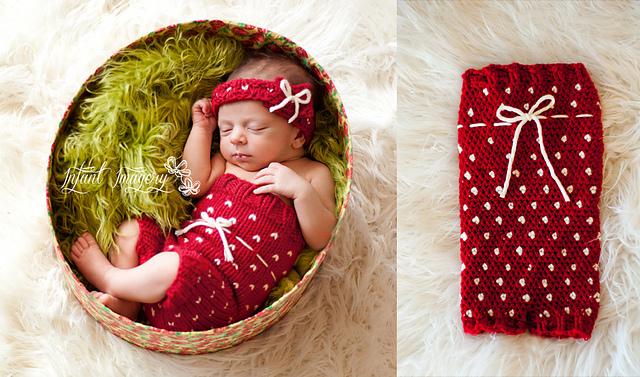 One of my earlier Newborn Photo Prop patterns was this cute Strawberry Shorts Set. 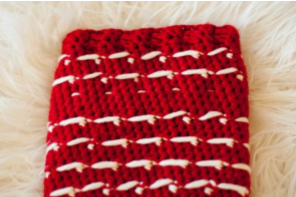 Designed in both crochet and knit, make these summer shorts in red with white “seeds” throughout, and your little strawberry is going to be simply edible….that’s how cute she’ll look! This design is also fun to make in solid colors as the finished project turns out so versatile that way. 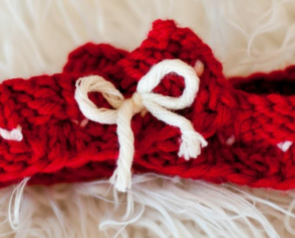 This free crochet baby pattern features bulky (5) yarn and size 5.5mm (I/9) crochet hook. Repeat rounds 6-11 until your piece measures approx. 9.5” (24.25cm) long from the edge. End on a repeat of round 9. SC into same st as CH1, and next 24 stitches, and leave the other 24 sts. Join the first 24 stitches in the round by slip stitching first and last sts, CH1 and place stitch marker. Join these 24 stitches in the round by slip stitching first and last sts, CH1 and place stitch marker. Cut yarn and secure and weave in ends. Using your yarn tail from earlier on and your yarn needle, seam up the crotch section as needed. Use your yarn needle and white yarn to put a strand through the middle section without “seeds”. I took my yarn in and out of one stitch with three sts in between. Tie a bow in the middle front. Repeat rounds 6-11 until your piece measures approx. 10” (25.5cm) long from the edge. End on a repeat of round 9. SC into same st as CH1, and next 26 stitches, and leave the other 26 sts. Join the first 26 stitches in the round by slip stitching first and last sts, CH1 and place stitch marker. Join these 26 stitches in the round by slip stitching first and last sts, CH1 and place stitch marker. Repeat rounds 6-11 until your piece measures approx. 11” (28cm) long from the edge. End on a repeat of round 9. SC into same st as CH1, and next 30 stitches, and leave the other 30 sts. Join the first 30 stitches in the round by slip stitching first and last sts, CH1 and place stitch marker. Join these 30 stitches in the round by slip stitching first and last sts, CH1 and place stitch marker. Repeat rounds 6-11 until your piece measures approx. 12” (30.5cm) long from the edge. End on a repeat of round 9. SC into same st as CH1, and next 34 stitches, and leave the other 34 sts. Join the first 34 stitches in the round by slip stitching first and last sts, CH1 and place stitch marker. Join these 34 stitches in the round by slip stitching first and last sts, CH1 and place stitch marker. Repeat rounds 6-11 until your piece measures approx. 13” (33cm) long from the edge. End on a repeat of round 9. SC into same st as CH1, and next 36 stitches, and leave the other 36 sts. Join the first 36 stitches in the round by slip stitching first and last sts, CH1 and place stitch marker. Join these 36 stitches in the round by slip stitching first and last sts, CH1 and place stitch marker.